Do you love electric scooters but wish they could do more? If the answer is yes – then this Razor electric scooter could be the ultimate product for you! The Razor AX200 Electric Off-Road Scooter allows you to take your scootering experience a lot further than you normally would, as it is built and constructed to go where regular electric scooters can’t. As the name indicates, the RX200 (a name that sounds pretty awesome in itself) takes you off the road – freeing you from the need to stay on flat and paved surfaces – and out on an adventure, which is something electric scooters haven’t been able to do up until recently. It is a quality product with unique features, which anyone from 13 and up can enjoy safely and which gives its rider the opportunity to explore freely without having to stick to the regular roads. This scooter has the top speed of 12 mph (19 km/h), which makes it possible to race down those off-road tracks quite fast! Hold on to the handlebar and start out with a low speed until you feel completely comfortable with the acceleration functions and the break, and after that you can freely roam around at 12 mph; impressing all your friends on a dirt road somewhere, or just using it as a fast and convenient way to get downtown or to work. 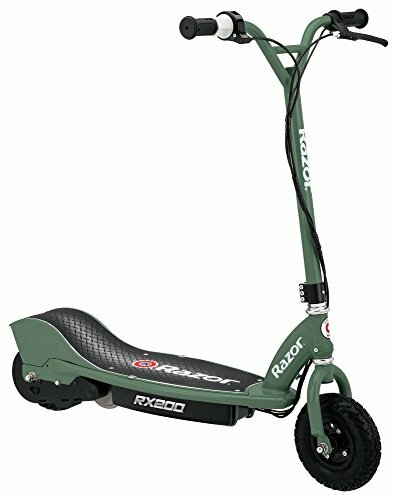 The chain-driven motor is both powerful and fairly quiet, and it takes you effortlessly across, grass, gravel, dirt and most other surfaces, and not like other electric scooter models that require a flat, hard and even surface to work properly. The wheels of this electric scooter are heavy duty and have thick 60 PSI off-road tires, which makes it great both for fun and play and for those who live outside the city, and you don’t have to worry about the scooter letting you down as soon as you hit a little bump. Fill them up with extra air if needed, to make sure nothing stands in the way of the next adventure. With riser style handlebars and twist-grip throttle – this product feels sturdy enough to allow its rider to safely navigate through the more difficult terrain. It has soft rubber grips and hand operated rear disc brakes, which is a completely new feature that enables the ultimate drift- and stopping power. The scooter is light-weight enough to be brought to an immediate stop, should that be necessary, and the steel frame and fork are easy even for a child to master. The grip tape on the base provides a reliable non-slip effect. The rear sprocket drive-train with a freewheel is perfect for coasting, and the scooter will drive for 40 minutes continuously without having to be charged in between. This opens up for millions of opportunities when it comes to daily outings and fun in the trails, and you can always bring the charger in case you would need (or want) to charge it up when out somewhere. The charging time is fast, and you can be back on the roads (or off the roads) in no time after having run out of battery charge. When you purchase this product the battery charger is included, and the rechargeable battery is 24V sealed led acid, and can handle hundreds of charges without it affecting the battery life. 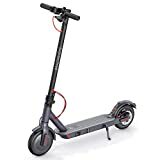 There is a retractable kick-stand for you to quickly park your scooter just about anywhere, it is spring loaded which means it will retract in an instant as well when you are in a rush and eager to get going. This is a scooter designed not to hold the rider back in any way; be that when riding around (since it can go off-road) or when parking or heading off. The Razor AX200 is recommended for children over the age of 13 and for light-weight adults, as the weight limit (the maximum carrying weight) is set to 154lbs. It is fine to use for younger children as well as long as there are adult supervision and sufficient time for the child to get used to the scooter before being allowed to play with it, and happy buyers report that it works well for two children to ride it at once. 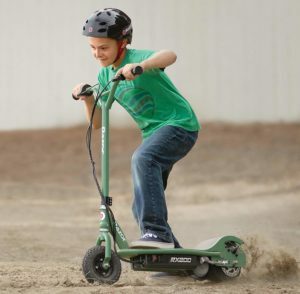 Remember, however, that while it is an off-road scooter that is built to go on most surfaces, accidents can still happen, and it is, therefore, a good idea to teach children to ride it with a helmet. This electric scooter is perfectly suitable for adults as well as the handlebar can be raised to fit those a bit taller, but the weight limit should be respected to avoid hurting yourself or damaging the product. It could be a great mean of transportation for the person who is looking to get from one place to another; such as to work without having to drive or take the bus, to the bus station or train station (if work is a bit far away), when heading over to a friend’s house or when just wanting a fun way of moving around. It is basically made for just about anyone who weighs under 154lbs and who is willing to be responsible when using it and respect local traffic laws and scooter regulations. This applies for young children as well; because as long as there is a certain level of maturity as well as parental supervision – there is no reason to deny a child a fun time on a versatile scooter that allows you to ride on fun dirt roads and to play outside with your friends. Having a hard time convincing your kid to step away from screens and play outdoors? This electric scooter might be the solution, and that little extra push they need to put the tablet down and head outside. Last but not least – an electric scooter could also be a good option for someone older who might not be able to move around as easily anymore, but it would require that the person can handle standing up for the time he or she plans to be using the scooter. If this is the case, the Razor AX200 is perfect since it isn’t wobbly and since the risk of accidents is minimal due to its off-road features. While kids will use these electric scooters to run wild on the tracks somewhere – a senior citizen might instead find it useful for easy transport. It is not hard to understand why regular scooters and electric scooters have grown so much in popularity over the past 10-15 years, as it is both a fun and a simple way to transport yourself from one point and to another. It is also a toy that never gets boring, and that kids can have fun with while also getting some fresh air. This product, in particular, has everything that we would like to see in a quality electric scooter, as it is both sturdy and reliable. It can go places where a regular electric scooter could never go, which is not only convenient when trying to get around – but it also makes it more fun for your kids since kids are known to like exploring and getting dirty. The grip-friendly handlebars and the no-slip tape on the base make it safe for riders all ages; children, adults and elderly, which gives this product a big extra plus. Having a scooter that can be useful for more than one family member is a good compromise, and it can also teach children a valuable lesson about sharing their belongings. We love the extra thick tires that are made to go over small rocks and twigs with ease, and that it can be driven on grass and dirt just as well as on a well-paved road. It is one of those products that can be used by everyone and used for everything, and the charger is incredibly easy to bring along in case you would run out of battery somewhere along the way. All you need to do is to plug it into an electric outlet and wait for a couple of hours, and after that, the fully charged scooter can drive for up to 40 minutes without needing a re-charge. This is usually more than enough time for an adventure and should more time be needed – take a quick break while it charges; have a coffee or take a little rest. No biggie! The Razor AX200 is a quality product that combines off-road features with a simple yet eye-catching look, and it is likely to appeal just as much to children as to adults. Regardless of what you would be planning to use your electric scooter for – this is an option that will last and that will provide the whole family with fun times out in the sun.